-not including a couple of his one-offs that were reprinted within the Prog (itself an incredibly rare occurrence, I think the only other time that’s been done was on Dredd?). Also not including Monster, which I may as well plug again following the Jesus Redondo post! In general, Quinch is rather sweet. Halo Jones, Toy, Toby, the Glyph, General Cannibal, the planet Moab. The dude fleshes out characters real good, y’know? Meet the Glyph: comics' most memorable forgettable character. I’m tempted to lead with ‘beard, being a wizard’, but I’m not sure either had much bearing on his time with 2000AD. Simply put, he is clever, funny, and a crafter of neat plots that always make sense. Did I mention clever and funny? Those two stick out above all, for me. Great at creating rounded characters within a fiendishly short space of time. When not being overtly funny, he has a tendency to reach for emotion/melodrama, looking for the inherent pathos of the story set-up. So let’s get into it, shall we? It begins, as ever, with Future Shocks. And what glorious Shocks they were! It’s not as if he had a story in every Prog, but as often as not, an Earthlet picking up 2000AD between progs 170 and 332 would get a small but perfect hit of Alan Moore cleverness and comedy. He didn’t reinvent the wheel or break the mould or any of those clichés – he just did the job extremely well. Concepts, characters, executions, tidy plotting, punchlines. Two characters created and made memorable without even being drawn! Love it. And that's not even the ending. A classic Moore trick here: shove in an incongruous and very British name to extarct extra laffs. 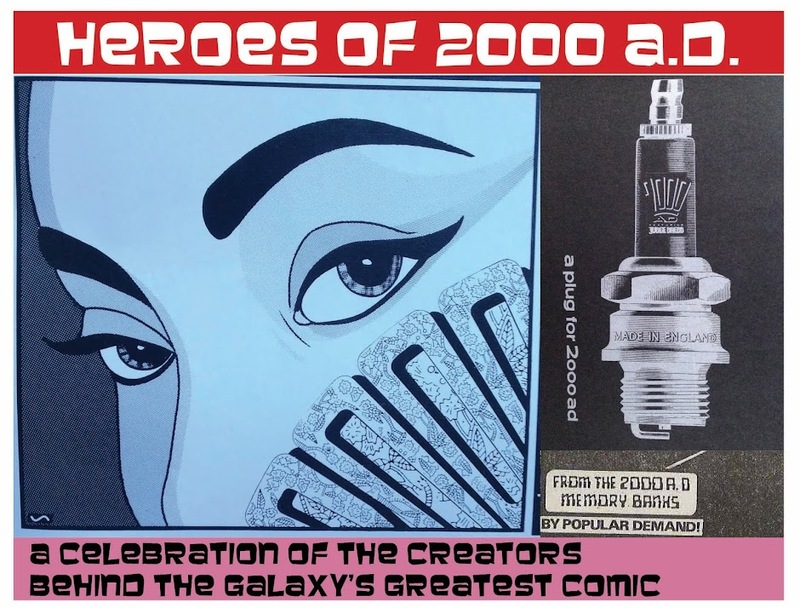 By all accounts, his panel descriptions were so detailed that it didn’t leave much room for the artists – and a lot of different artists tackled Moore’s scripts – to do anything wrong. But it clearly left a lot for them room to do right. There’s a thing people sometimes say about authors that they write compelling stories, but their actual ‘writing’ isn’t very good. A typical example of this would be multi-selling religio-thriller novelist Dan Brown. I’ve never read his books, but I a) believe the claim and b) find it entirely spurious at the same time. How bad can someone’s writing be if millions of people are still going to read all the way through a book? Moore's thoughts on rock stars in three easy stereotypes. Anyway, Alan Moore is like the dead opposite of that. His actual writing writing – the bits with character and dialogue and description – is plain great. It’s a pleasure to read. That his plots are usually entertaining too isn’t entirely relevant. Certainly with his Future Shocks, the plots are not always original, but it doesn’t matter as it’s fun in most every panel. And, as mentioned before, he really puts the effort in to make sure the plots make sense, keeping his stories self-consistent (a complaint he seems to deplore in other writers). But the details along the way there are a delight. So much information revealed in one simple panel. That's cartooning, folks. One of Moore’s first published stories in the Prog introduced a recurring comedy character, Abelaard Snazz. These strips are a curious mix of clever that isn’t always clever, and funny that isn’t always funny. Even the great Moore had to find his feet at the beginning. But the essential charm was there from the get-go. And so onto Moore’s first ongoing series. 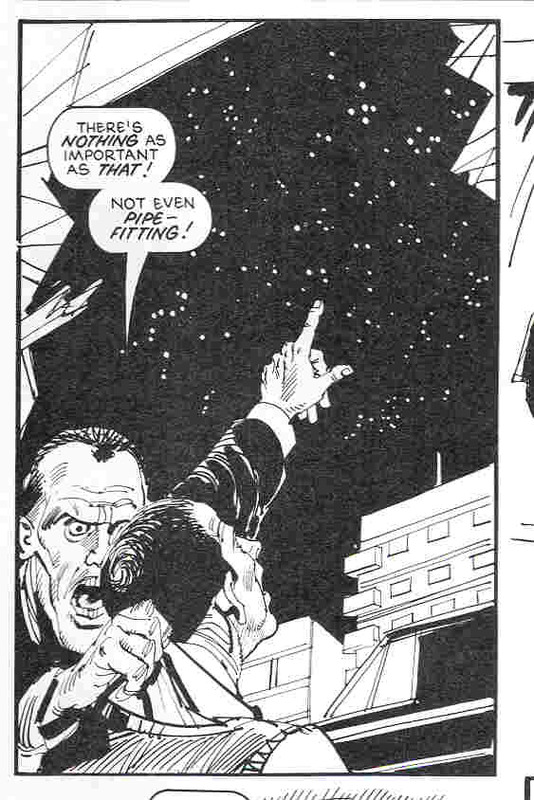 It would have been insane, after all that, for Tharg not to pester the man for a full series. First to run was Skizz, famously commissioned to match Spielberg’s E.T., a film that was storming UK cinemas when the strip ran, but not at the time Moore (and artist Jim Baikie) where creating the early episodes. Presumably, all that Tharg/Moore knew about the story was that it involved a nice alien arriving on Earth, befriending a child, and being on the run from the authorities. If you can read Skizz with a Brummie accent in your head, it's even better. For whatever reason, Moore chose not to copy much of E.T. at all, and instead borrowed far more influences from the hit UK TV show Boys from the Blackstuff. I’ve never seen that, but I gather it’s the inspiration for Loz, Cornelius and the general angry working hero/ “I’ve got my pride!” stuff. And this is fun. But for me, the real charm of Skizz is the attention to the details of Skizz as an alien, and the character moments in his relationship with Roxy. As mentioned above, it’s not the plot (although that’s great too), it’s the little things. Especially impressive by today’s standards is the effort Moore puts in to making each episode of the series be its own thing, while still absolutely pushing forward a continuous narrative. Again, it’s not like he’s being subtle with some of his themes, but it’s always entertaining to read, while occasionally smacking of being a bit clever. Oh yes, and Skizz is a real tear-jerker, too. I dare say 2000AD had had its teary moments before (most famously, Ro-Busters: the Terra Meks), but Skizz didn’t hide it behind giant robots hitting each other. See also Moore’s forays into the same Ro-Busters, and later ABC Warriors, in some fondly-remembered Annual/Special stories. I think part of why they’re remembered is the rare serious / tear-jerking tone. I do wonder if Moore noticed that readers really responded to this and took it with him in future writings. And there's some of that clever wordplay we like so much. One anomaly was his Rogue Trooper story. Anomaly because I don’t know that it’s terribly fondly remembered. He brings out a trick he’d later become famous for on Swamp Thing – taking a well-known character and revealing new details about their origin to startle and surprise the readers. So, when Rogue stumbles across ‘the first GI’, a forgotten and somewhat disfigured survivor of experiments, he and we feel sad and angry, in an entirely different way from the usual Quartz Zone trauma. For whatever reason, later writers never picked up on this tidbit, sparing us the endless antics of, say, Green Lantern. Back in the Prog, Moore was casually shoving pathos over a cliffside as he delivered episode after episode of D.R. & Quinch, a comedy delight of a series. Unapologetically violent, it’s Moore firing again on all cylinders: character, dialogue, setting and plot all acting as one. With Alan Davis’s art to really ram home the craziness, and doing a lot with the characters to sell sarcasm and insincerity at various key moments. Mangling song lyrics for our pleasure. For all that Moore himself doesn’t seem overly fond of the strip, and the vague (but I think irrelevant) controversy over lack of originality (see footnote below), I will never not love this series. If there’s one bad thing about it, it’s that its shadow looms long and large over the Prog. Sure, there have been other comedy series, and will be again, but any such series that dares to involve students is simply going to fall short. 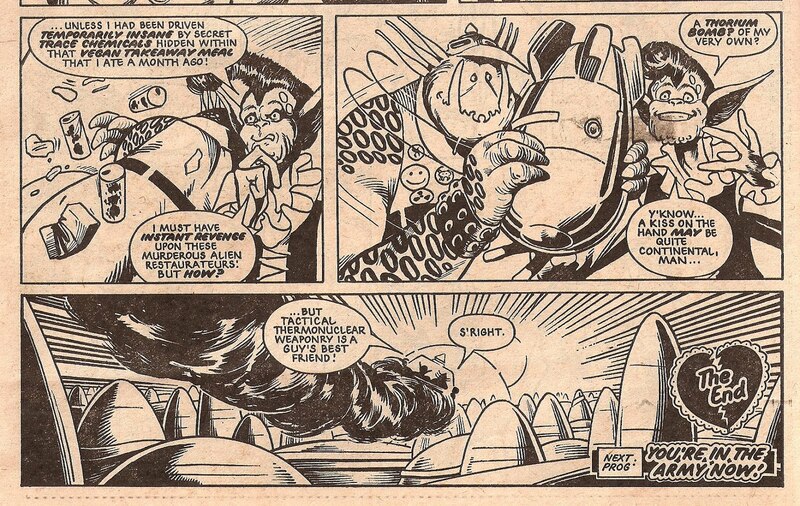 Which is a shame, because 2000AD needs a student comedy. Bec and Kawl had its moments, and Survival Geeks is fabulous, but they’re not bloody D.R. & Quinch, y’know? So much satuire in so few panels. Could this be the single funniest story in the comic's history? And so to Moore’s final parting masterpiece, the Ballad of Halo Jones. 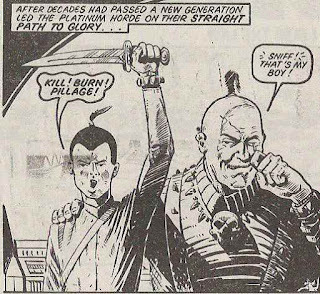 It may or may not be your favourite strip for 2000AD, but it’s the one that’s most discussed, the one that gets the literati interested, the one that (apparently) brought a bunch of new readers to the Prog in the mid 80s. And also yes, it’s effing marvellous. Even Book 1, which could count as one of the ‘early, funny ones’, to borrow a phrase reserved for beloved auteurs. It’s an extended adventure over, under and through a shopping mall, amongst other things. With muggers and other delights. But really, the thing about Halo Jones is that it’s very grown up. 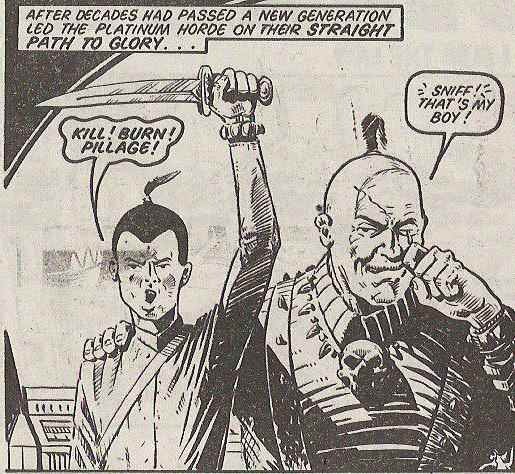 It’s not necessarily ‘better’ than Moore’s other 2000AD work, but it doesn’t have anything that one might call childish about it (except maybe the mad robot dog subplot in Book II, famously editorially mandated to make the strip more child-reader-friendly. Probably rightly, as that goes). It’s nuanced, character-led storytelling about an everyman who happens to be a woman, a BIG deal at the time, and arguably still is now as society and pop culture both remain inherently sexist. There's black humour, then there's making jokes about treatment of PoWs. Clever, funny and now poignant as well. Everyone knows that Book III (the first I read, when I was far too young to understand an awful lot of it) is the best. It’s got the bumming around the galaxy stuff, the war stuff, the grown-up romance, and the first bits about the idea that Halo Jones is destined for great things. Now that's what I call an emotional wallop. But of course we won’t.Alan Moore has his reasons for not wanting to produce work for 2000AD again, strethcing back to the owners of the time when he last worked there (and maybe other reasons too). As I understand it (basically I'm guessing! ), it'd be to do with the fact that he and Ian Gibson retain no copyright over the characters he created for IPC/Fleetway/Egmont/Rebellion. He's not the only one to be cross about this - perfectly reasonably - although he is perhaps the only one who is determined to stick to some strict definition of principles about the whole thing, while other creators have been pacified by some or other means (inlcuding, but not limited to, needing money). See also: Moore's feuds with Marvel, DC and I'm sure other publishers too. Dammit, Alan, I know you know ther reason even if Waldo 'D.R.' Dobbs forgot it! -both of which cover his 2000AD work. 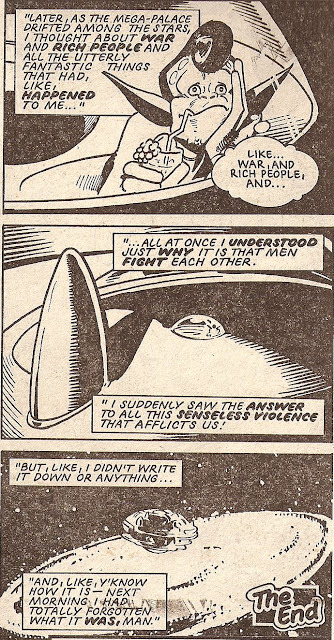 Feel free to Google 'Alan Moore arguments' for long-lasting fun times. …and those are just the ones I can call to mind based on the title; I bet most of the others are pretty great. *OK, not ALL the best ones, but if anyone were to rank them all, pretty much all of his would be right up there, wouldn’t they? **As many readers will know, Moore was very specifically inspired by a US series known as ‘O.C. and Stiggs’ that ran as short prose stories in National Lampoon magazine. The style and tone is very similar, to be sure, as Moore himself has been quick to a) be upfront about and b) lament. Frankly I don’t find this to be a problem. Also, I’d NEVER have heard of OC & Stiggs if it hadn’t been for the immense joy and enduring popularity of DR & Quinch. The point is, I have no qualms giving Moore (and especially Alan Davis) credit for creating these characters! That was a good one, Alex. I'll be sacrificing a virgin to Glycon tonight, in your honour. I had to look that one up! Good old Alan Moore, adding to my store of knowledge even via a passing comment!